France’s plan of attack against Syria: Should François Hollande join Barack Obama in “punishing” Assad? 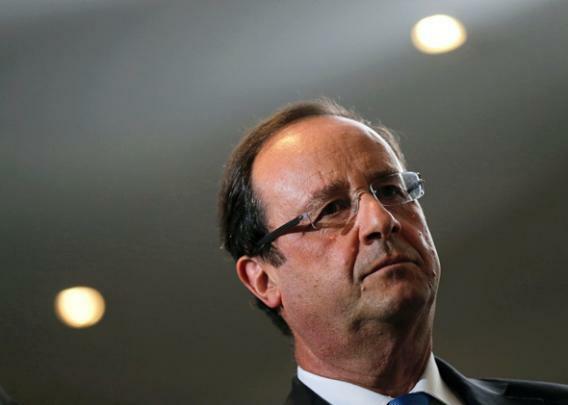 French President François Hollande might be President Obama’s only military ally in Syria. “Punishment” against the Damascus government, as French President François Hollande put it, would consist only of aerial strikes on military units that have used chemical weapons, according to a source in the French Cabinet. Chemical ammunition warehouses would be spared in order to avoid uncontrollable explosions. The militaries of potential coalition forces believe they know exactly where these warehouses are. Therefore, it’s not a question of attacking Syria’s entire army, as was done against Saddam Hussein’s army in Iraq and Muammar Qaddafi’s in Libya. Hollande made that clear in an interview in Le Monde. The idea is “punishment,” in the French president’s words, or “a shot across the bow,” to use the American president’s phrasing, in response to Bashar Al-Assad’s use of chemical weapons, particularly on Aug. 21, which undoubtedly resulted in about 1,000 deaths. Western forces don’t want to destroy Syrian airplanes, tanks, or command centers—destruction that would surely change power dynamics on the ground—they just want to send a reminder that chemical weapons are a “red line” for the international community. Military forces will be ready to strike by Saturday, Aug. 31, but the strikes will probably be postponed because of the British Parliament’s having vetoed an intervention. The Labour Party said no to David Cameron to live down Tony Blair’s participation in attacking Saddam Hussein alongside George W. Bush. The challenges and failures of the Iraq intervention cost Blair dearly, and Ed Miliband, the current Labour leader, clearly wants to rehabilitate his party’s image in the eyes of a public very reluctant and skeptical of the benefits of this kind of operation in the Arab world. Foreign affairs minister Laurent Fabius spent lots of time on the telephone Thursday trying to convince Miliband to soften his position and to make only reasonable demands of the Cameron government in the Commons. If London doesn’t go to Syria, Paris can go—or so Hollande says—but to intervene alone with Washington would be seen as the opposite of what’s happening in Britain: the French government making a fool of both its own Parliament and the United Nations. And if America intervenes unilaterally, Europe will once again appear powerless and spineless. France should therefore take its time and find a legal basis for action. In other words, we must expand the consensus on a strike, propose a resolution to the U.N., and clearly show that it has made every effort to get it adopted. Experts who have been on missions to Syria must also very quickly appear before the Security Council to testify about what they’ve seen: Such testimony could be sufficient legal grounds. All this could take a week to 10 days. Translated from the French by L.V. Anderson and Cécile Dehesdin.